Well one week we are up and then another week we are back down. Age of X-Man may suffer from too many cooks in the kitchen and yet another book fails to meet the standards of the series. Out of all six series in this event we have now have three that are spectacular and three that are just down right bad. It is not a surprise to have some issues in a major event not meet expectations, but to have have half the series be really bad or just mediocre is not good. This book suffers from HUH!?? 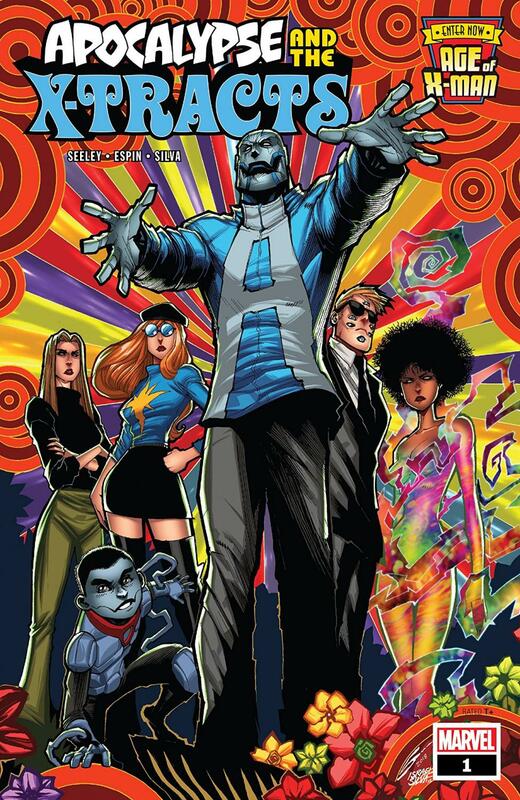 I really don't understand the choice of direction of this book and especially the members who are aligned with Apocalypse. As you can tell from the cover the book has a 1970's psychedelic look and tone to it. I understand that each book has it's own look and feel but this one, for me at least comes out of know where. It just doesn't fit and many of the characters don't feel like themselves ad their powers are different. We are in an alternate universe or something, but in all the other books at least the characters still felt like themselves, just also at the same time a bit different. This book is just all kinds of wrong. While the art is bright, fun and exciting the feel for the book over shadows it and can't save it from being a terrible read. There are many moments in the character writing and even in the character styling that it's so over the top it took me out of the book. I think I rolled my eyes or when huh!? so many times I lost interest quickly in the story. The other thing that really bothered me about this book was we got to see the X-Tracts on some missions but no hint at what the mission was, or even why they were on a mission. They just get called back and that's it. At least in the other books we got a hint at what was going on or a tease to keep us interested. This book is like a psychedelic painting, it just throws some stuff at the canvas and hopes it sticks, and unfortunately it doesn't. Overall I'm afraid this book may be important to the overall story otherwise I would say skip it. This was not a fun read for me and I'm not looking forward to four more issues of it. When it comes down to it, pick this up if you want a complete Age of X-Man read and collection, otherwise maybe just read a synopsis and skip this book altogether.